We'll meet up in Lyon at 1:30 p.m. in front of the Brasserie Georges for our departure by coach towards Martigues (**Depending on mooring's availabilities, the stopover in Martigues may be replaced by Port Saint Louis du Rhône). Passengers are welcome to board our ship in Martigues at 6:00 p.m. After comfortably settling into your cabins, we'll introduce our crew at a welcome cocktail. CLASSIC: Discover the Camargue. 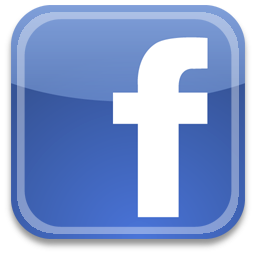 We’ll visit a "manade" (horse breeding farm) and learn about how a manadier works with the animals. 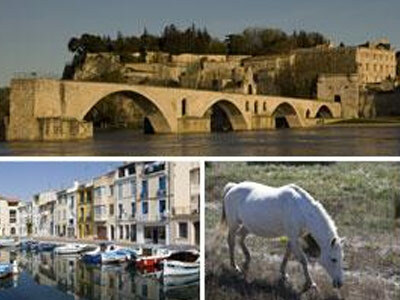 CLASSIC: Guided tour of Arles, a highly cultural town enriched with vestiges from the Roman Empire. The afternoon will be spent cruising to Viviers. Join us on an excursion common for both Classic and Discovery excursions packages: Guided tour on foot of the city. Join us on an excursion common for both Classic and Discovery excursions packages: Tour of the Ardèche Gorges. We'll return to the ship in La Voulte. In the afternoon, join us on an excursion common for both Classical and Discovery excursions packages: Discover the Vercors and taste the famous Clairette de Die. We'll return on board in Tain-l'Hermitage. DISCOVERY: Explore Vienne on a Segway for an original tour of this charming “Gallo-Roman” city. DISCOVERY: Bike ride through the main monuments and districts of Lyon. We'll return on board, and depart at nightfall to admire the city lights in Lyon. We'll begin to cruise early in the morning towards Tournus. Join us on an excursion common for both Classical and Discovery excursions packages: Visit the famous Hospices de Beaune, whose facade is today regarded as a superior example of Northern Renaissance civic architecture. 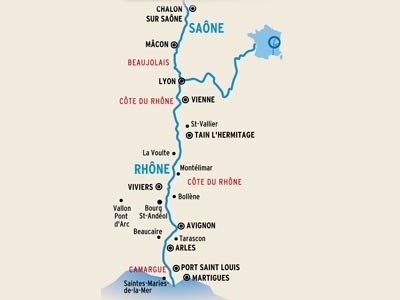 We'll continue along the Burgundy Wine Route and through villages with names that evoke the great French wines. We'll then return on board in Chalon-sur-Saône at the end of the afternoon. Tonight is our gala dinner and evening.